¿Se inspiraron en la protesta de 2016 con la activista Ieshia Evans? A handout photo made available by the World Press Photo (WPP) organization on 13 February 2017 shows a picture by Thomson Reuters photographer Jonathan Bachman that won the Contemporary Issues – First Prize, Singles award of the 60th annual World Press Photo Contest, it was announced by the WPP Foundation in Amsterdam, The Netherlands on 13 February 2017. 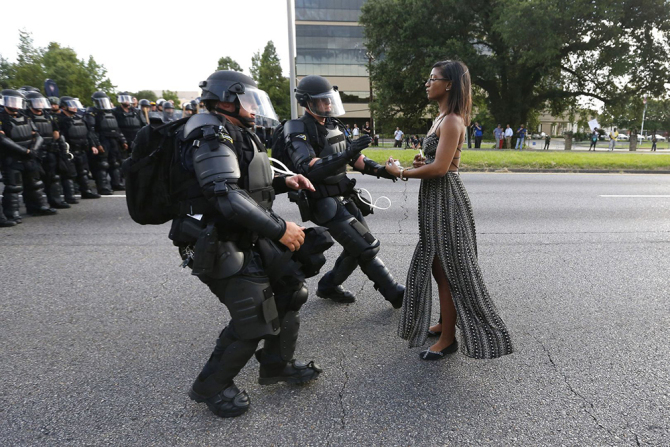 Lone activist Ieshia Evans stands her ground while offering her hands for arrest as she is charged by riot police during a protest against police brutality outside the Baton Rouge Police Department in Louisiana, USA, on 09 July 2016. Evans, a 28-year-old Pennsylvania nurse and mother of one, traveled to Baton Rouge to protest against the shooting of Alton Sterling. Sterling was a 37-year-old black man and father of five, who was shot at close range by two white police officers. The shooting, captured on a multitude of cell phone videos, aggravated the unrest coursing through the United States in previous years over the use of excessive force by police, particularly against black men. ¡¡PUES ESTA CRISIS DE UNITED AIRLINES DE 2017 ES PEOR, MUUUUCHO PEOR!! ¡¿Qué alguien me explique cómo en el siglo XXI sacas a rastras a un médico por el avión – después de haberle golpeado tan fuerte que se le saltaron dos dientes y le hicieron una fractura en la nariz- y todo por un “overbooking” y porque el pasajero se negó a bajarse!? Tal y como se han sucedido los hechos… No tiene nada de parodia… ¿no crees? Intolerable, increíble e inhumano. No puedo decir más. En fin… ¡Feliz Semana Santa!